This radio controlled model features proportionately driving and steering functions that allow precise driving and manoeuvring. The light at the front and rear is permanently switched on during operation. In stand-by mode, i.e. after switching on the model and before connection to the radio-control module, the flashing light indicates the model is ready for start-up. The model is powered with three standard AAA batteries. Rechargeable batteries of the same type can also be used. If the batteries run below a specific level during operation, the light flashes rapidly indicating that the batteries will soon be empty. Two identical batteries also power the radio-control module. All Siku Farmer32 trailers and coupling devices for front and rear coupling can be used with these models. 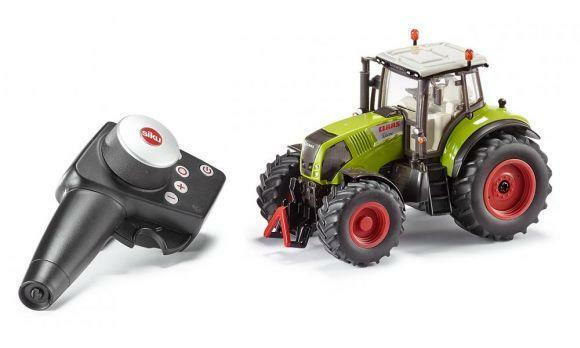 The data socket integrated at the rear section of the tractors facilitates use of Control accessory models such as trailers, whirl rakes and ploughs.